Woodbridge Violins restores and repairs stringed instruments and supplies quality violins, violas, cellos and accessories to suit every type of player from virtuoso player to absolute beginner. We buy quality stringed instruments or we can sell your violin, viola or cello on a commission basis. We also have excellent value instrument rental schemes available. We can also offer over 500 quality instruments and bows and we are also able to offer virtually every conceivable accessory available for string players, including cases. Russell Stowe who qualified at the internationally renowned Newark School of Violin Making in 1984 set up the shop in 1991. After qualifying Russell spent several years with a well-known, long established violin house in the Midlands. His increasing reputation led him to establish his own business in Woodbridge. For the virtuoso, accomplished amateur or budding Vanessa Mae's out there, we stock a wide variety of good handmade violins, including both modern and antique examples of German, French or English origins. There is also an excellent choice of smaller quality handmade violins available in 1/4, 1/2 and 3/4 sizes. 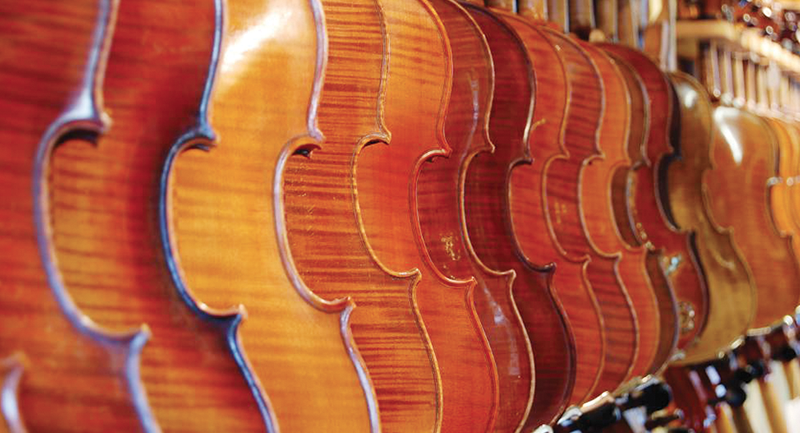 Whether you simply require an 'e' string fitting whilst you wait or you have an Italian violin in need of a neck graft, you can be assured we will carry out work to the highest standards. We pride ourselves in major restoration work which often entails fully dismantling the instrument and restoring it to its original condition. Where instruments are subject to substantial restoration work we like to work closely with you and welcome your input. This is particularly relevant with the final set up to the instrument. Accessories for musical instruments are becoming increasingly significant for today's string player, and we can offer almost every conceivable accessory for stringed instruments. We stock mutes, shoulder rests, chin rests, rosin, cello endpin holders, music bags, cases, varnish cleaner, humidifiers, metronomes, stands, Wolf Note Eliminators and more!